The Museum of Contemporary Art (MCA) celebrates its 50th year with the theme “Experience today what people will be talking about tomorrow.” The MCA will be offering an exciting series of exhibitions, programs, events, and the unveiling of the museum building’s newest redesign. As part of the offerings for the 50th anniversary programs, the MCA is hosting In Sight Out, a partnership with Pitchfork that brings Pitchfork writers and editors with celebrity music guests. On October 13, rapper Vince Staples will be chatting with Pitchfork Managing Editor Matthew Schnipper, and at a date TBD, Grammy winner and Chicago native Chance the Rapper will be joining journalist Adrienne Samuels Gibbs for a talk. Tickets for the Vince Staples talk started selling September 6 and have since been sold out. Tickets and details for the Chance the Rapper talk (originally scheduled for November 17) will be announced at a later date. MCA Hearts Chicago | FREE! On October 21-22, the MCA is holding a weekend-long event called MCA Hearts Chicago, consisting of programs, talks, workshops, and interactive artist projects that focus on the history of the MCA and Chicago. 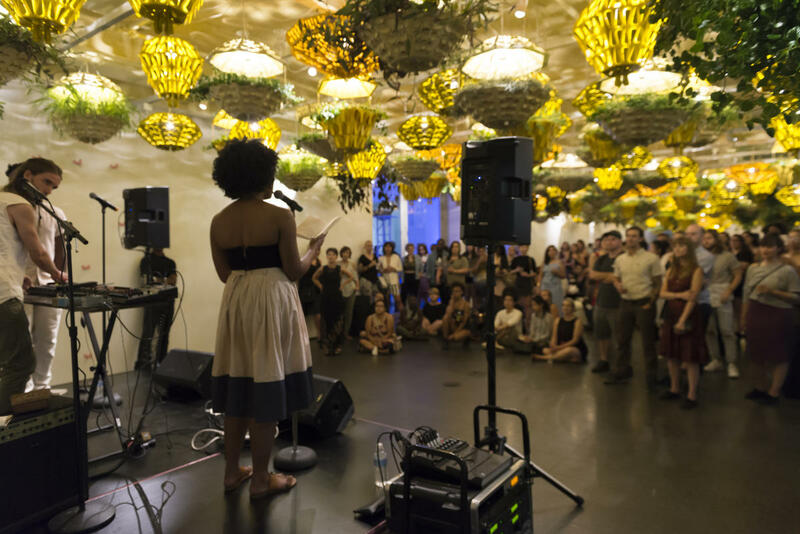 Highlights of MCA Hearts Chicago include the debut of Open 24 Hours by Chicago artist Edra Soto that features interactive writing stations and workshops. This also marks the launch of the museum’s new civic engagement space called The Commons, which provides visitors a place to read, relax, and engage in other forms of art. A new major exhibit called We Are Here is also debuting. 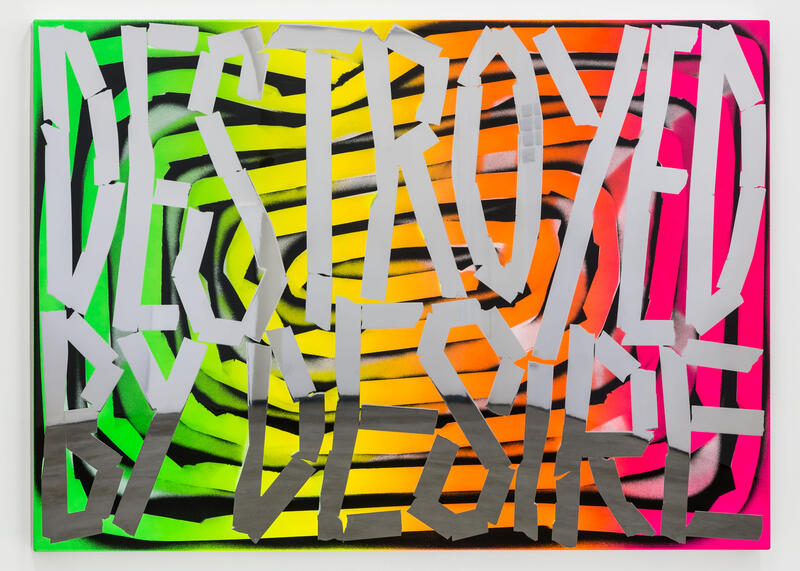 It is a three-part exhibit that focuses on how contemporary artists critique the world around them and how they respond creatively and provocatively. 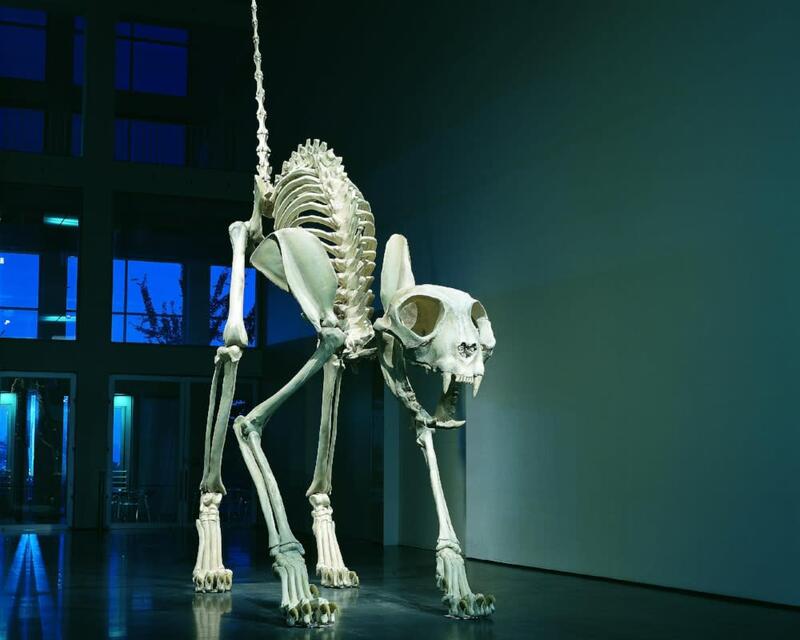 The exhibit is composed of works from different contemporary artists such as Andy Warhol, Pierre Huyghe, and Jasper Johns (among others) and encompasses a variety of media, including painting, sculpture, video, film, sound, and installation. Each part of the exhibit was put together by one of the MCA&apos;s global team of curators—Senior Curator Omar Kholeif, Curator Naomi Beckwith, and Associate Curator José Esparza. During that weekend, the MCA will be host to a slew of special guests including Lupe Fiasco, who will be performing as part of the FREE atrium concert (free tickets open for reservation October 18). Billy Corgan of The Smashing Pumpkins, Chicago Tribune theatre critic Chris Jones, fashion icon Ikram Goldman, actress Cheryl Lynn Bruce, and local musician Jamila Woods will all be giving pop-up talks throughout the museum. Sunday’s program will honor MCA’s 50th anniversary with a focus on the museum’s history and future. Chicago artist Alberto Aguilar is organizing an exhibition featuring furniture that have been previously used in MCA exhibits, while local artist Brendan Fernandes presents the dance-based work Art by Snapchat, which is inspired by the 1969 MCA exhibition Art By Telephone. Art in Free Spaces | FREE! Having over 12,000 feet of free public space in their grounds, the MCA commissioned new art installations from both locally and internationally renowned artists. This will continue throughout the year, where the MCA plans to bring on dozens of artist works and events. 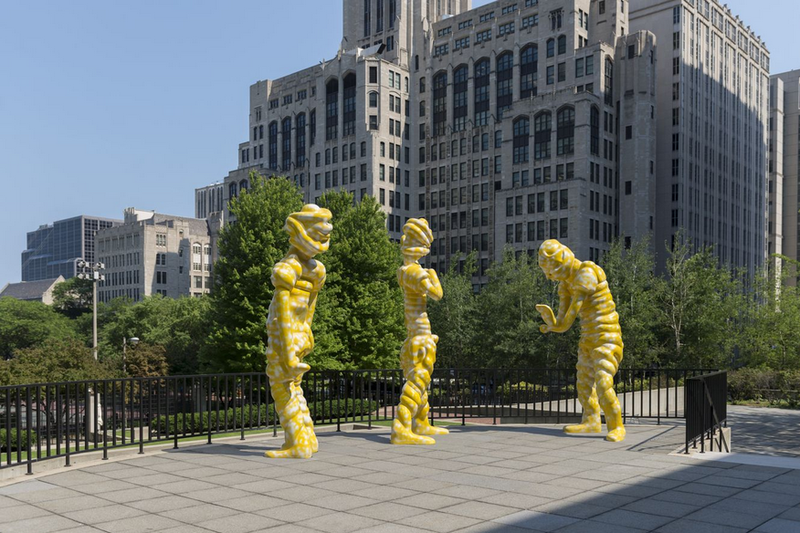 Explore these temporary and semi-permanent works of art at the Atrium, the Commons, the Sculpture Garden, the Street, and the restaurant, Marisol. Some of the noteworthy ongoing installations include Ernesto Neto’s Water Falls from My Breast to the Sky, one of the most frequently Instagrammed installations, located at the Street. 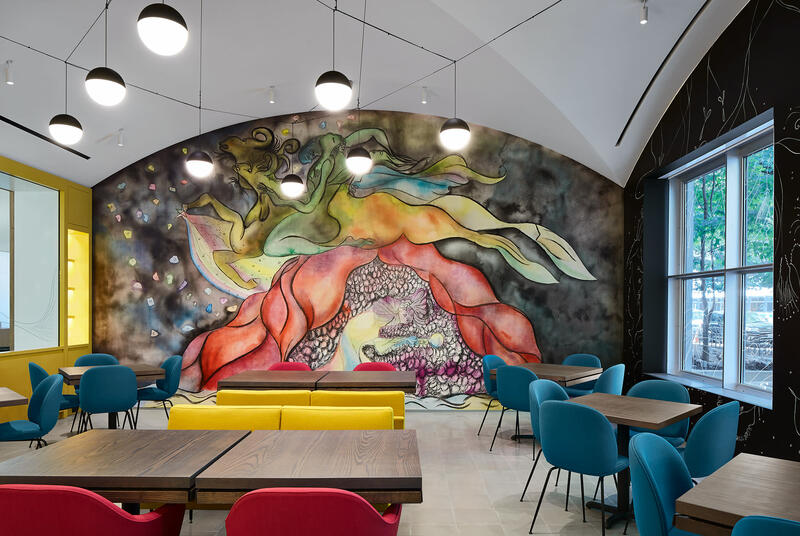 Also worth checking out: Chris Ofili’s The Sorceress’ Mirror, a beautiful Georgia O&apos;Keefe-inspired mural at Marisol; and Thomas Schütte’s Big Spirits XL on the terrace. Upcoming exhibits to watch out for include Edra Soto’s Open 24 Hours (on display beginning October 21) at the Commons and Maurizio Cattelan’s Felix, which opens on October 14 at the Atrium. Originally the brainchild of several artists, art dealers, art critics and architects, the Museum of Contemporary Art Chicago has quickly grown to be one of the most prestigious cultural institutions in the country. Will you be celebrating the MCA’s 50th anniversary? What events are you excited about? Let us know in the comments below!